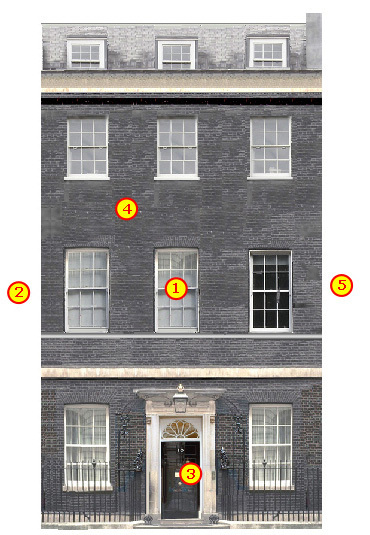 > No.10 Downing Street is both home and office to the Prime Minister. The first floor (1) is used as the living area and it extends next door (2) over Numbers 11 and 12. > The black exterior (4) was once the result of years of London pollution. The brickwork is in fact a yellow colour and is now painted black to keep the familiar appearance. > Downing Street has been gated since 1989 when Margaret Thatcher was in office, preventing public access. There was a similar barricade in 1918 when violent protest by supporters of Irish Independence was anticipated.